Ferrari 458 Italia – Italian sports model Ferrari. The premiere took place on 15 September 2009 at the Frankfurt Motor Show 2009. This model is the successor to the Ferrari F430. 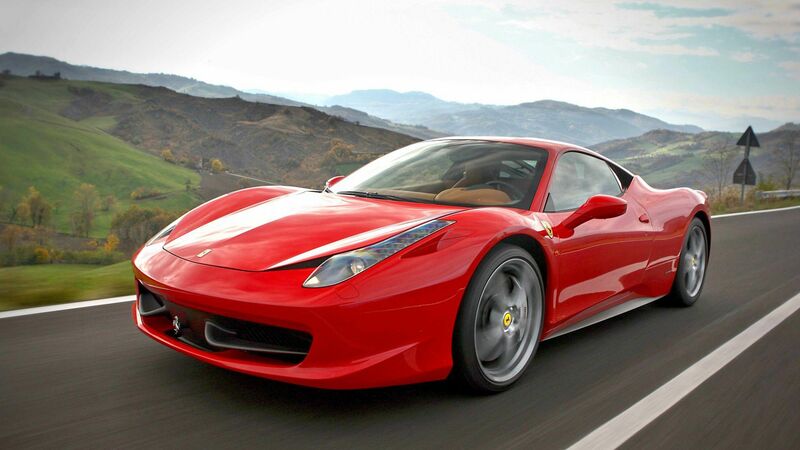 458 model name traditionally refers to a type of engine – 4.5 liter V8. For car styling bureau is responsible Pininfarina. New Ferrari can accelerate to 325km/h and accelerates to 100km/h in 3.4 secondsAverage fuel consumption is 13.7 l/100km, and CO2 emissions – 320 g /km. In August 2013 the Ferrari presented an enhanced version of the car called the 458 Speciale. V8 4.5 liter was strengthened to 605hp and 540 Nm. This means that the car is equipped with the most powerful, atmospheric V8 unit I’ve ever designed a Ferrari engineers. 458 Speciale weighs 1270kg, which is about 90kg less than the standard version of the 458 Italia. Up to 100km/h in 3.0 seconds and to 200km/h This 9.1 secondsby 0.4 out 1.3 seconds faster than the 458 Italia. On the test track Fiorano 458 Speciale time reaches 1 minute and 23.5 seconds, which is about 1.5 seconds better than Italy. In 2013 the company introduced the DMC Estremo Edizione model, which is about 60kg lighter than the standard version. Changed the look of the front of the body, which got a new air ducts, splitter and aggressive lines. Additionally used many elements from carbon fiber, a new mask, side skirts and rear spoiler sizable. W 2011 roku samochód zdobyÅ‚ tytuÅ‚ World Performance Car of the Year.